Custom bike building is a long game. It’s easy to make a short-term splash, but difficult to keep the momentum going over several years. In Europe, there are a handful of companies with the requisite grit and vision, and the Wrenchmonkees are one of them. 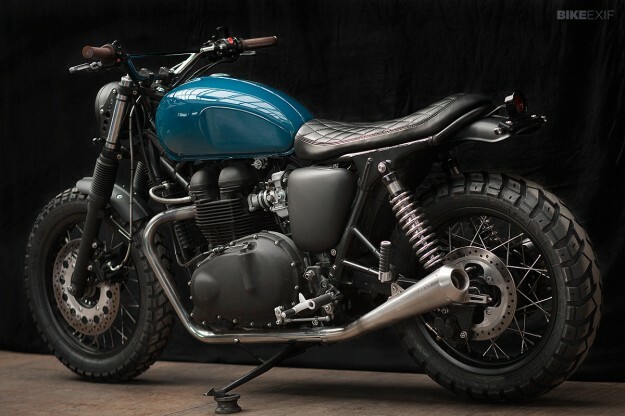 This Triumph Thruxton is the 68th bike to roll out of their Copenhagen workshop. For builders Per Nielsen and Nicholas Bech, the hardest part of this project was finding a bike and working within a budget. Triumph’s more recent ‘modern classics’ are in short supply in Denmark, and they hold their value well. 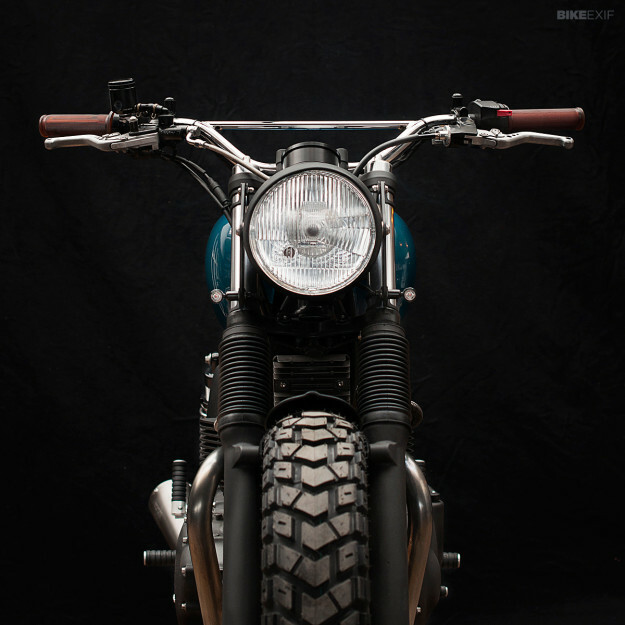 A Thruxton that is seven years old and has just 30,000 km on the clock can cost a steep $15,000, once tax and registration is factored in. After a lot of searching, the Monkees located a 2005-model Thruxton 900 for a fair price. They decided to give it a low-key scrambler vibe with some vintage touches, going for maximum visual effect with minimum outlay. On the sheet metal front, they’ve added a rib to the top of the tank and a vintage Kawasaki rear fender. The only frame work is a new rear loop at the back, with a slight kick-up and a matching custom seat. The front fender has been chopped, and the stock rims and hubs are powder coated. 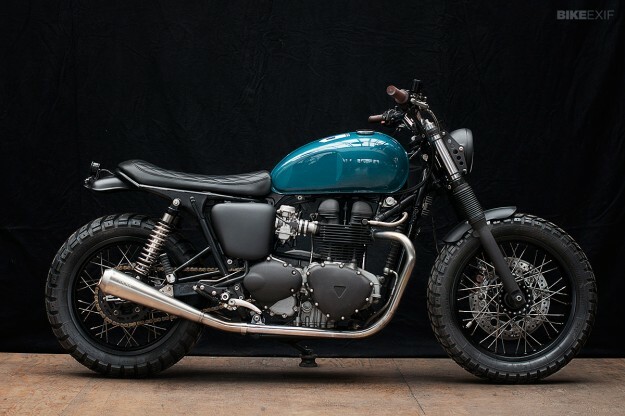 The Thruxton sits around an inch lower than stock, with the forks dropped 25mm and slightly shorter Hagon Nitro shocks fitted at the back. Progressive-rate springs improve handling dynamics up front. Old-school motocross bars create a more upright riding position than the original low-set clip-ons, with Pazzo Racing levers and Tarozzi footpegs enhancing control even more. 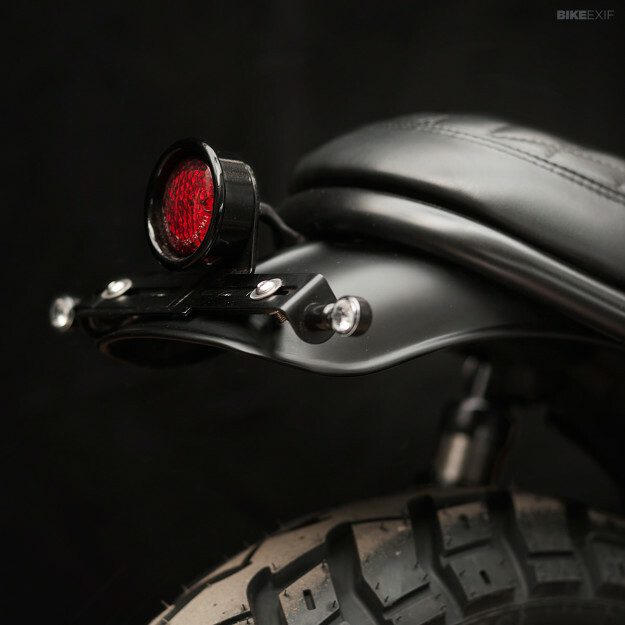 The 6½-inch headlight, rear light, and LED blinkers are straight from the Wrenchmonkees catalog. The instrument is a black anodized Motogadget Chronoclassic speedo and the ignition lock, rectifier and horn have been discreetly relocated. 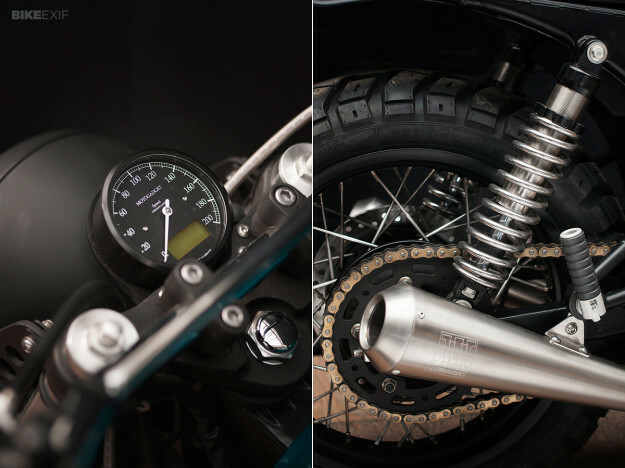 The exhaust system has been modified with help from the Italian brand Spark, which regularly collaborates with the Wrenchmonkees and designed the systems for the Yamaha Yard Built XJR1300 and SR400 bikes. Here, the original headers were trimmed around three inches, and new midsections created to mate with the subtly flared mufflers. The fit is factory-level. 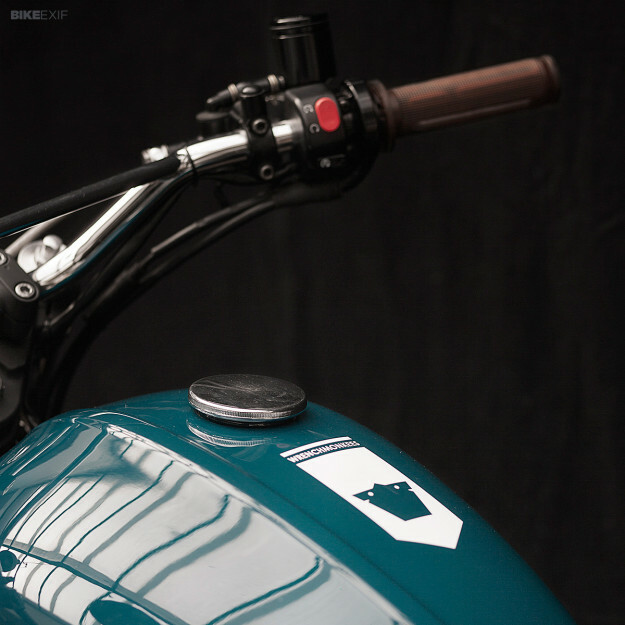 Deep, glossy mid-blue paint on the tank provides the finishing touch, with a white Wrenchmonkees emblem just behind the off-center, vintage-style filler cap. Pure class, from front to back. Monkee #68 is for sale at 145,000 Kr (around $26,900). View the Wrenchmonkees’ website and Facebook page.